Yoga for me is a daily discipline. I took a class at the gym once about ten years ago and that two minutes of laying on the floor (savasana) was profound. I knew I wanted more of that feeling in my life. The more I practiced, the more I saw the gap between my normal state and the state I was in after a yoga practice. 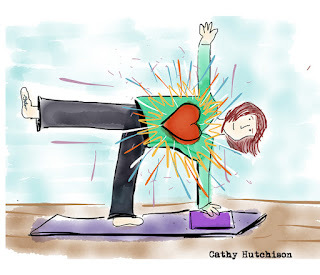 Racing thoughts, to do lists and tension in my neck and shoulders was replaced by quiet, calm and learning what it felt like to have the muscles in my neck completely relax. The longer I've practiced, the more those qualities have followed me off the mat. In ancient times, yoga was passed down from teacher to student. There were variations depending on who you studied under. Here and now there are lots of yoga studios, which tend to have the flavor of the owner's yoga practice. As for me, I mostly study with Shanon Buffington--who I met on the recommendation of friends who had taken her teacher training. I've become a yoga geek in that I enjoy reading the books written by the people who brought yoga to the US. (Indra Devi, BKS Iyengar and TKV Desikachar are favorites. All studied under the same teacher.) I also am easily enamored of yoga gear and jewelry. However, at the end of the day it isn't about reading or props or classes. It is about practice. Consistently, over time and without break.